There are instances of failure and success throughout the history of United Nations peacekeeping operations. The instances of the UN Assistance Mission in Rwanda in 1994 and the UN Protection Force at Srebrenica in 1995 are difficult chapters in a complicated past. In contrast, the success of the UN in stabilizing East Timor in 1999 and early 2000 was realized by defeating pro-Indonesian militias and gaining the trust of the surrounding community fighting for independence. Additionally, the ongoing efforts of the United Nations in the Kashmir region (UNMOGIP) have been vital in keeping a volatile area from potentially exploding into nuclear war. Another example of successful UN peacekeeping includes the United Nations Interim Force in Lebanon (UNIFIL), forged from the fires of the 1978 war between Israel and PLO fighters operating from southern Lebanon. This UN mission was substantially enhanced in 2006 following a repeat of the conflict. It also included a historical development in UN peacekeeping, the establishment of the Maritime Task Force (MTF) attached to UNIFIL, the first such naval operation of its kind under the auspices of the United Nations. Created in 2006, the MTF was designed to “support the Lebanese Navy in monitoring its territorial waters, secure the Lebanese coastline and prevent the unauthorized entry of arms or related materials by sea into Lebanon.”1 Additionally, the withdrawal of the Israeli blockade of Lebanon in September 2006 was brought about due to the existence of the MTF, assuaging Israeli fears of a rearmed Hezbollah due to unregulated sea traffic along the coast.2 The MTF gains its authority from UN Security Council Resolution (UNSCR) 1701 ending hostilities between the Israeli military and Hezbollah elements; yet the MTF found its true birth in a request of then-Lebanese Prime Minister Fouad Siniora to the UN Secretariat for a naval force to help Lebanon patrol its coastline and train the country’s underdeveloped navy.3 This allowed not only for the eventual withdrawal of the Israeli blockade but also for the UN Department of Peacekeeping Operations (DPKO) to try something new – deploying blue helmets on the high seas. Since the decision to accept command of the MTF in 2011, Brazil has been recognized both by UNIFIL command and the international community. 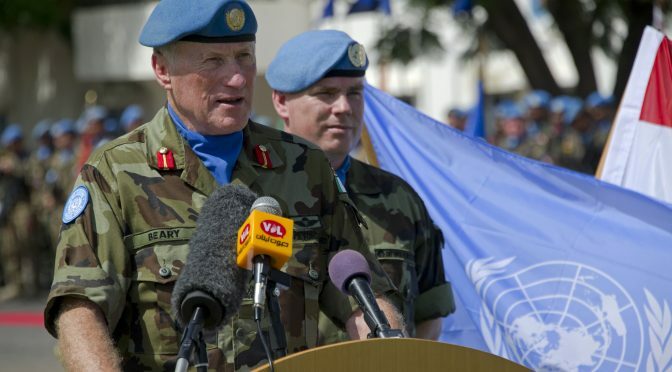 Major-General Michael Beary, having served from 2016 to 2018 as UNIFIL’s Head of Mission, commended the nation’s role in UNIFIL’s overall mission: “The sailors who patrol Lebanese waters under the flag of the UN are pathfinders [who have] developed a UN Doctrine on Maritime operations and proven to both the Security Council and the international community the benefits that the maritime domain can bring to peacekeeping operations. … I do not take this ongoing support for granted and I would like to thank both the Brazilian government and Navy for their continued commitment to UNIFIL.”9 Brazil has sought to position itself as a global player in international relations, emphasizing the rule of law and seeking diplomatic answers to international conflict. The foreign policy establishment in Brazil has pointed to the enduring interstate peace enjoyed in Latin America as proof of Brazil’s leadership in the region. Even with the escalating crisis in Venezuela, regional leaders have managed to hold at bay military interventions or saber-rattling, seeking humanitarian, diplomatic, or economic solutions. In their leadership over the MTF, the Brazilian Navy has gained valuable training and insight from fellow countries, while sharing their own knowledge as well. This has contributed to a robust training program in Brazil, as crewmembers and ships rotate command on the MTF. As new crewmembers join the task force, the outgoing officers bring with them knowledge and abilities gained through their time on the MTF. These lessons are then implemented at Brazil’s dedicated program, the Brazilian Peacekeeping Operations Joint Center (CCOPAB). Even amid the relatively high costs and distant theatre of operations associated with UNIFIL MTF, scholar Adriana Erthal Abdenur, in International Peacekeeping, posited three main motivations for their continuing involvement: “projecting Brazil in international security; deepening bilateral relations with Lebanon; and naval capacity-building with a view to expanding Brazil’s role in the South Atlantic.”10 An early test for President Bolsanaro’s commitment to UN missions will center on his decision whether to continue his country’s leadership over the MTF. 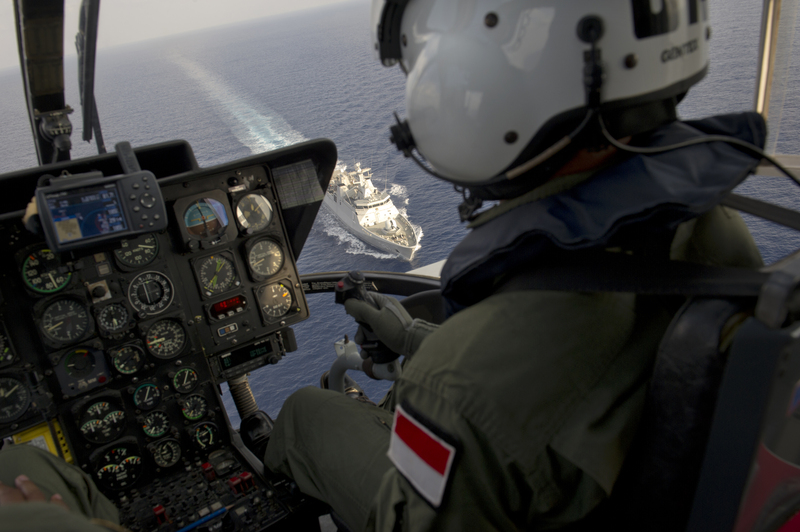 With the documented successes of the UNIFIL MTF, the United Nations has been able to gain valuable insight into what it takes to operate and maintain a naval task force. Additionally, countries have shown a proven willingness to contribute to its budget and its fleet. 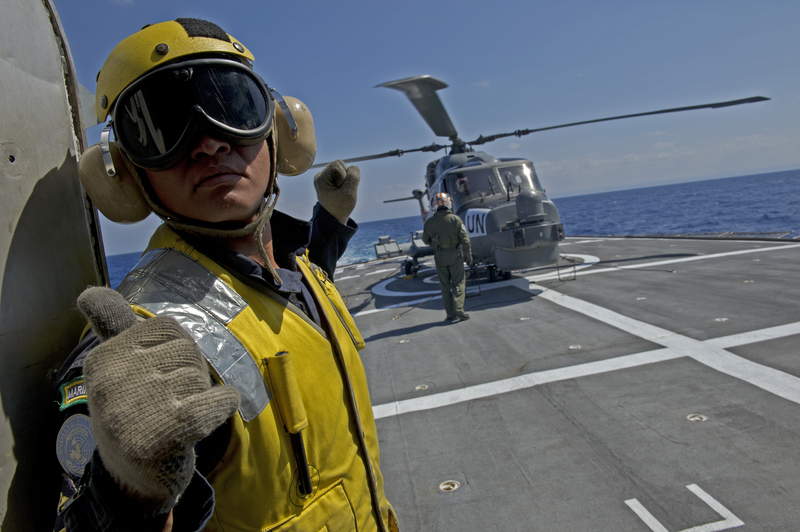 While helping to secure peace on the Lebanese coastline, countries have been able to put navies to good use, gain international standing, and share best practices with partner alliances. While UNIFIL MTF will likely continue to operate well into the next few years, other maritime hotspots may also need to be addressed. A UN-led MTF becomes an attractive option when a targeted region is too tense for local actors or alliances to effectively manage certain security concerns. China began its aggressive assertion over the islands when environmental reports conducted by the UN Economic Commission for Asia and the Far East in the late 1960s suggested a significant amount of oil, natural gas and mineral resources could be discovered and exploited in the region. Additionally, the waters around the islands are fertile fishing grounds, capable of providing a serious boost to the vibrant and competitive fishing industries already operating in the region. However, due to the political and military insecurity in the area, a truly stable environment has not been maintained to make the most of the fishery. While there is not yet cause for alarmism, the potential for the East China Sea to devolve into inter-state warfare is present. Unlike the undeveloped state of the Lebanese Navy, the fleets of China, Taiwan and Japan are among the most advanced in the world. As such, the region needs to be addressed in a constructive and neutral manner by the United Nations Security Council, with an eye toward instituting a framework for a peaceful resolution of the dispute. The UN Secretariat should consider drafting an outline for establishing a maritime task force to operate in the East China Sea, and one that may be constituted of extra-regional naval forces. The serious legwork has already been completed, thanks to the efforts of the UNIFIL MTF; as then-UNIFIL Head of Mission Beary noted, the UN has already developed a naval doctrine; now, the international community must give the doctrine a chance to branch out and improve on the accomplishments found in Lebanon. David Van Dyk is an associate editor with the Center for International Maritime Security and a doctoral student at the Helms School of Government studying Public Policy with a focus in foreign policy. He has received a Master of Arts in Public Policy with a focus in international affairs. He can be reached at dvandyk@liberty.edu. 4. “Interview with Cdr Jean-Marc Claus, Commanding Officer Bns ‘Leopold I’, Flagship of Com Unifil Mtf 448.” Naval Forces 30, no. 2 (April 2009): 108. 5. “Scoop for the Belgian Navy.” Naval Forces 30, no. 2 (April 2009): 106. 7. “Rising Powers in Stormy Seas: Brazil and the UNIFIL Maritime Task Force.” International peacekeeping. 23, no. 3 (June 1, 2016): 389–415. 10. “Rising Powers in Stormy Seas: Brazil and the UNIFIL Maritime Task Force.” International peacekeeping. 23, no. 3 (June 1, 2016): 389–415. 11. Thompson, Jeremy. “Fly the U.N. Pennant Over East Asian Waters.” U.S. Naval Institute Proceedings 141, no. 9 (September 2015): 40–45.